Alchemist, Glassmaker, and Priest Antonio Neri was born in Florence, Italy on 29 February 1576. From his baptismal record, we know the exact time of birth: "three hours and 25 minutes past sunset." In terms of current timekeeping conventions, sunset occurred on that particular Thursday at about 6:15 pm (local time) so the big event happened at 9:40 pm. It might seem a bit odd to have such accurate records -- almost as if an astronomical event were being recorded. Actually, that is exactly what was being done; astrology of the sixteenth century drew a strong correspondence between 'macroscopic' events in the heavens and more earthly matters. To have an exact time of birth was seen as a way to gain greater insights into the events of ones personal life and to plan in a way that was more in harmony with the natural order of things. Of all the days to be born, 29 February was considered among the least auspicious. A dire Northern Italian folk proverb states "An bisesti, o la mama o 'l bambi" predicting that, born on this day, a child or its mother was fated to die by year's end. Indeed, the Italian word naming the day, bisestile, had become a synonym for misfortune or calamity and is still the case for the French cognate bissêtre. Whatever stock the family put into ancient superstitions, happily this prophecy did not come true for Dianora or her fourth child Antonio. Although his was a February birth, it was perhaps not as deep into winter as one might assume. Due to a discrepancy in the Julian calendar, which was in force then, the Spring equinox of Neri's birth year happened much earlier in the calendar than today, around 10 March, in fact. Infant mortality was not uncommon and for a child to die unbaptized only magnified a family's trauma. Church theologians had debated since the fourth century on the fate of the souls of such children. Most Catholic families baptized infants as soon as humanly possible, in Antonio's case the very next morning. Births occurring within Florence were officially registered at a central baptistery, San Giovanni, the ancient octagonal basilica standing directly in front of Florence's main Cathedral. Thursday, 1 March 1575: Antonio Lodovico was born to Mr. Neri di Jacopo and Dianora di Francesco Parenti, residents of San Pier Maggiore parish. The time of birth was 29 February, at 3 hours 25 minutes past sunset. The godparents are Francesco di Girolamo Lenzoni and Ginevra di Federigo Sassetti. The year is recorded as 1575 because in those days, Florentines celebrated the New Year on 25 March. Today we consider January, February and March to be part of the new year. Antonio joined a growing family that already contained siblings Lessandra, Jacopo and Francesco, and later would number ten children. His father was thirty-six year-old Neri di Jacopo Neri, (Neri Neri to his friends) and his mother was twenty-one year-old Dianora Parenti. 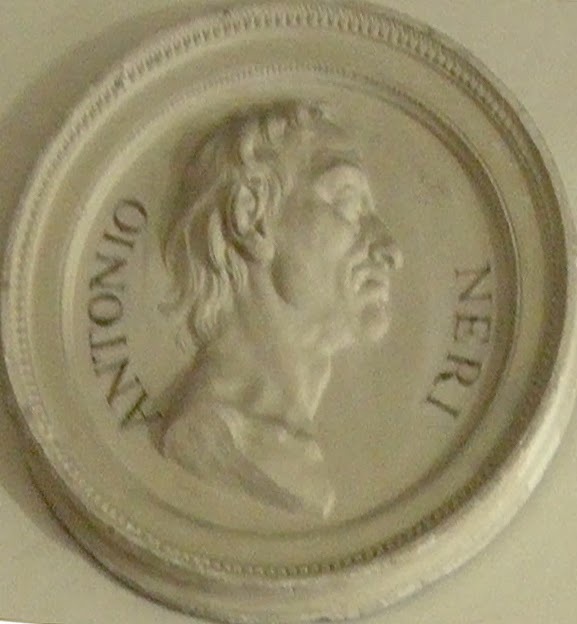 Neri Neri was a prominent doctor and later was appointed to be the personal physician to Grand Duke Ferdinando. Dianora was the daughter of Francesco Parenti, Michelangelo's lawyer. Tradition dictated that births were celebrated with a house party open to friends and neighbors. Thirty-four year-old Francesco Lenzoni, Antonio's godfather, would certainly have done his best to attend. His family included Florentine senators and Francesco himself would later become Tuscan ambassador to Spain. Godmother Ginevra Sassetti, in her late fifties, was also from a prominent family. Her nephew Filippo would send plant specimens back from India to be inspected by Neri Neri and their mutual friend Baccio Valori who would become director of the Laurentian Library in Florence. Antonio Neri, would go on to learn the finer points of alchemy and glassmaking, developing new formulas and techniques that would be applied throughout Europe. 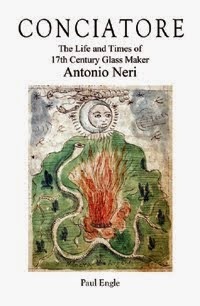 In 1612, he published the world's first book entirely devoted to formulating glass, L'Arte Vetraria. It seems especially appropriate that we pause and raise a toast (in glass, of course) to his accomplishment and to the end of February, looking forward to warmer days ahead. Buon compleanno Antonio!